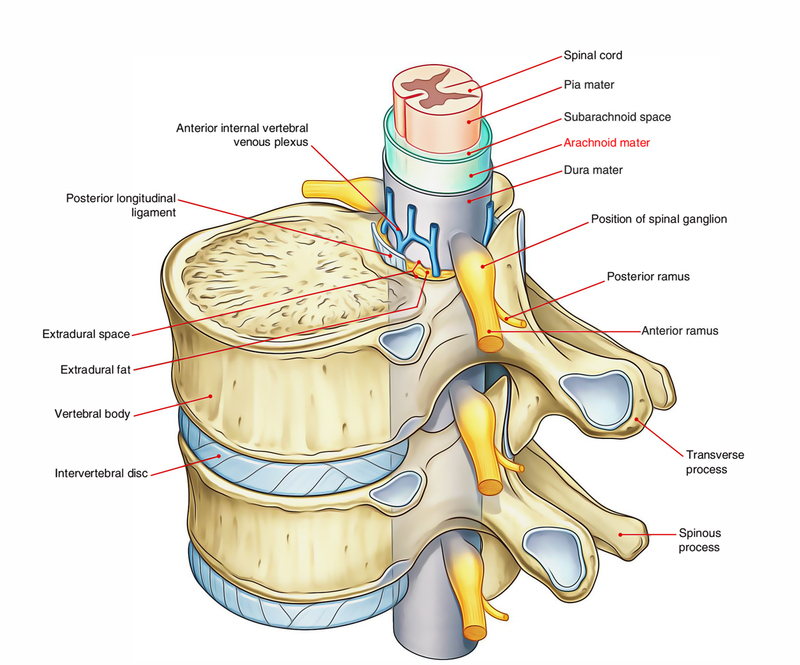 The arachnoid mater is located amongst the pia mater internally as well as dura mater externally and is a fragile impermeable membrane that surrounds the spinal cord. A wide space which is filled with cerebrospinal fluid, referred to as the subarachnoid space separates it from the pia mater. A number of fine filaments of connective tissue traverse the subarachnoid space. The arachnoid mater is continuous above through the foramen magnum with the arachnoid surrounding the brain. At the plane of the lower boundary of the second sacral vertebra it terminates inferiorly on the filum terminale. Along the spinal nerve roots the arachnoid mater proceeds, creating small lateral extensions of the subarachnoid space.